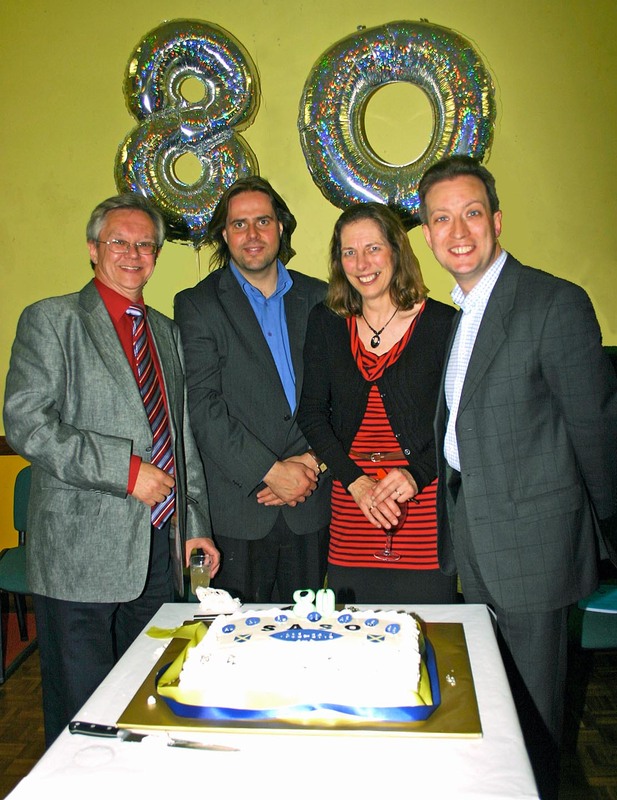 Three conductors helped St Albans Symphony Orchestra to celebrate its 80th anniversary last week together with violinist Jennifer Wigram – the orchestra’s leader who has worked with all of them during the past 30 years. Andrew Parnell (1983-2001) and James Ross (2001-2010) swopped their batons for a cake knife together with SASO’s current principal conductor Bjorn Bantock. The birthday party in St Saviour’s Church Hall was attended by friends and members of the orchestra, past and present. It followed a rehearsal when the orchestra played through the Symphony No 4 by Brahms, which will feature in SASO’s concert for the St Albans Festival on Saturday June 23rd. The celebrations included a congratulatory speech by SASO’s long-serving President, pianist Harvey Dagul, and an announcement that James Ross has agreed to become one of the orchestra’s Vice-Presidents. A bottle of champagne was presented to oboist Jerry Finlay, who is currently the longest-serving member, having played with the orchestra for 50 years. Kieran McGuirk, SASO’s chair, said: “It was terrific that so many people closely associated with our orchestra over so many years were there to toast its big birthday. Coming just a few days after our highly-praised anniversary concert in front of a capacity audience, we can safely say that St Albans Symphony Orchestra has reached 80 in the best of musical health.” He added that a retiring collection at the 80th anniversary concert had raised £463 for the Keech Cottage Children’s Hospice, while SASO’s brass section – playing in Christopher Place, St Albans at the weekend – supported the Bailey Sarwa Appeal’s street collection. “Fund raising for charity remains a very important part of what we can contribute as a successful community orchestra,” he said.